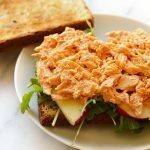 A few weeks ago we posted some pretty amazing healthy chicken salad recipes. PLEASE tell me that you checked them out and have made one or two of them. 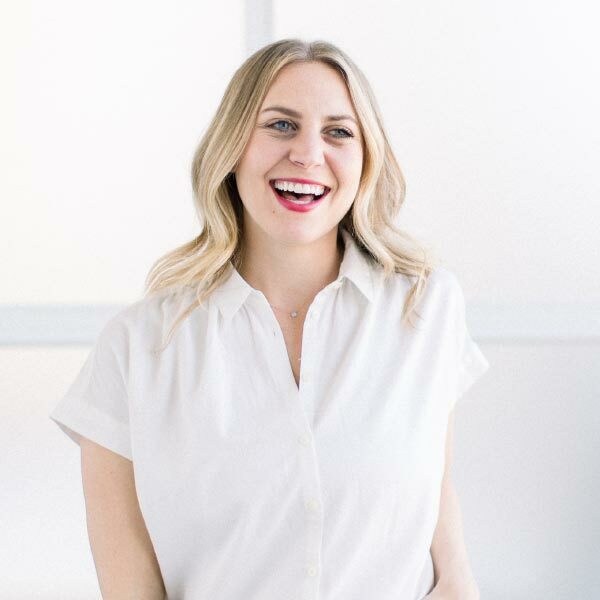 There are some of the tastiest and easiest recipes around town and we can’t get enough of them. 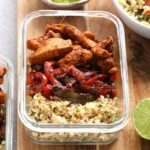 Lately, we have been all about repurposing meals from inside our fridge and all about fun meal prep meals that you can look forward to eating all week long. So? 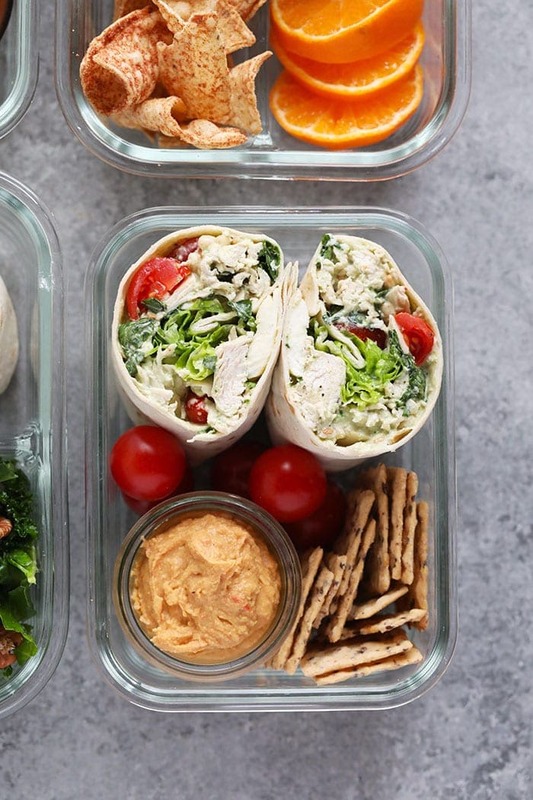 We took our 4 healthy chicken salad recipes and turned them into bento box ideas that will make your taste buds dance every day during lunchtime! Technically, a bento box is a single portion meal that you can buy at a restaurant or make at home. You will find bento box lunches on many Japanese and Thai restaurant menus. Our favorite bento box in Minneapolis right now is at Lemon Grass in Brooklyn. It’s so reasonably priced (like $12!) and you get so. much. food. A little bit of sushi, a little pad Thai, and a cream cheese wonton or two. 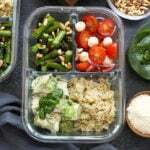 These days a lot of people associate bento box meals with meal prep because conveniently there are lots of glass meal prep containers that have compartments! 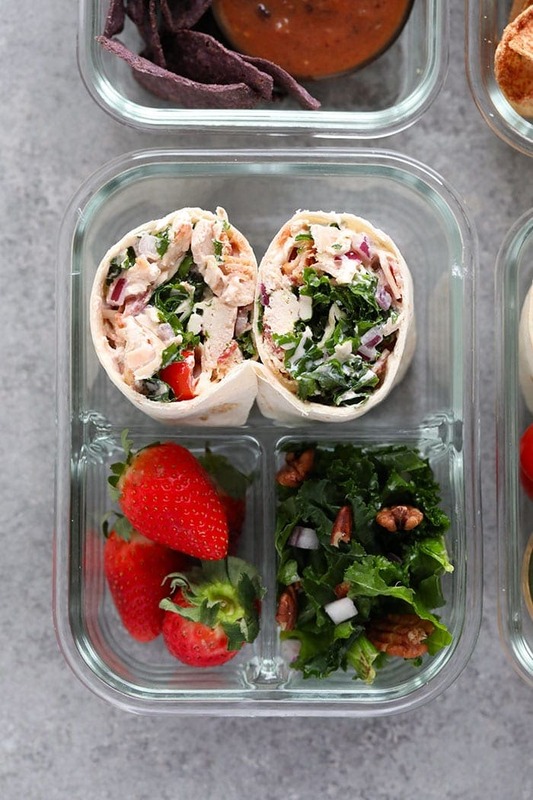 These are our favorite glass bento box containers. 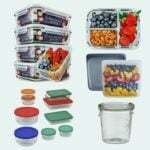 We love that they are glass, easy to clean, and that it is easy to separate everything you pack. Bento boxes are also great for picky eaters! And those who don’t like their foods to touch each other :D Which is why we always tell people you can turn ANY of our bowl recipes on Fit Foodie Finds into a bento box recipe by simply separating the individual elements of the recipe into your bento box container. 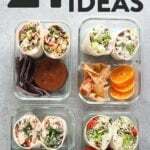 You can make your own bento box lunch with all of your favorite things, but there are a few guidelines that we like to stick to when preparing our bento box meals to ensure that our bento boxes are balanced and healthy meals on the go. 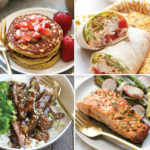 Protein: Let the main dish of your bento box be a protein-packed item such as a buffalo chicken wrap, spring roll, sandwich, pulled meat, or even charcuterie! A good rule of thumb is to make sure your bento box includes some kind of protein so that you stay full all day long. Fruits & Veggies: You can’t go wrong with any fruit or veggie. Whether they are cooked or raw, pack them in, people! We suggest using what you have in your fridge and what’s in season. Healthy Fats: When looking to pack a healthy fat or two in your bento box consider using an avocado, an olive oil-based dressing, or even nuts and seeds! 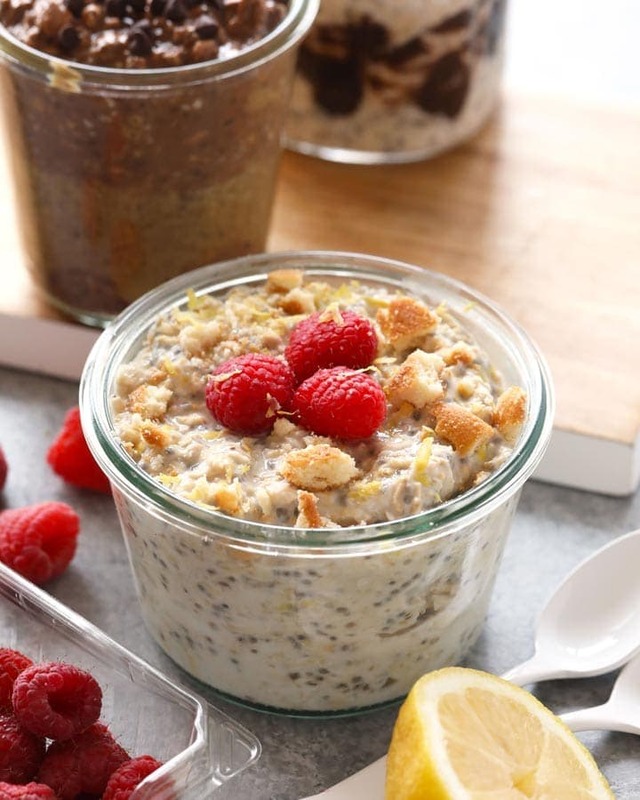 Fiber: Get your fiber on with any of our favorite Fit Foodie salads! Some of our favorite bento box-friendly salads are Quinoa Tabbouli, Thai Chili Corn Salad, and Mexican Quinoa Salad. You can also pack in other fibrous foods such as nuts, beans, and more veggies. Crunch: We love ourselves some crunchy tortillas chips, veggie straws, or gluten free crackers! If you have a favorite crunch, you do you! Almonds, cashews, and any other nuts are a great option, too. 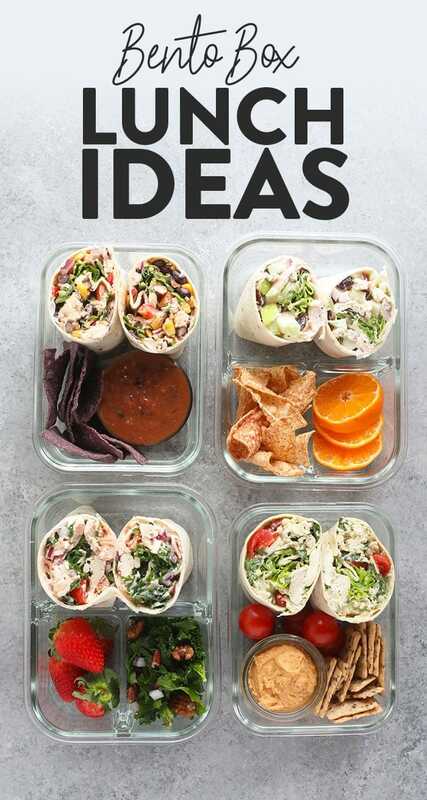 Dips: Bento boxes are perfect for incorporating dips into your lunches because the containers keep them neatly separate from the rest of the elements of your bento box. Depending on what your bento box includes, we recommend anything from our Homemade Healthy Ranch to Vegan Queso to Roasted Red Pepper and Goat Cheese Dip to Green Goddess Dip to Cilantro Lime Avocado Spread. We turned our flavorful pesto chicken into a wrap by adding romaine lettuce and wrapping it up in a tortilla. Served next to some cherry tomatoes, hummus, and whole grain crackers and you’ve got yourself a delicious, healthy bento box lunch! Get the recipe for the Pesto Chicken Salad HERE. Love southwestern flavors? 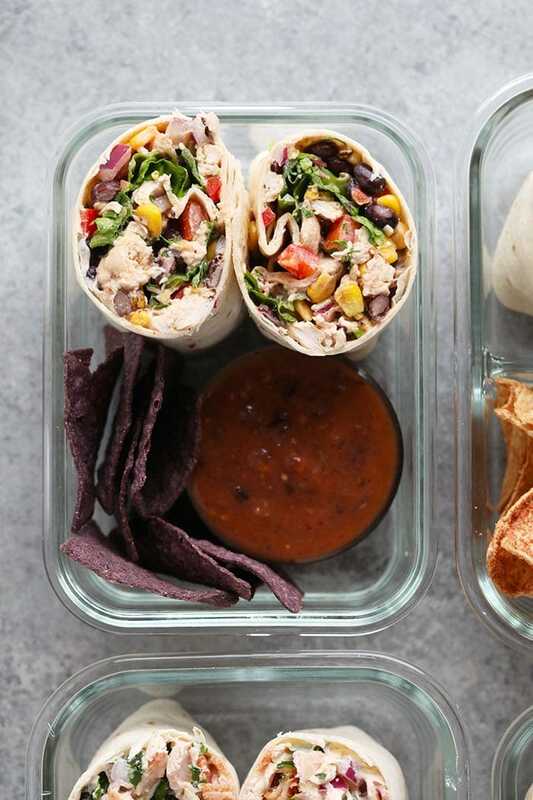 Try our healthier southwest chicken salad wrap bento box! It’s made with a citrus-infused southwestern yogurt sauce and a little bit of hot sauce to top things off! 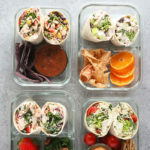 Take your southwest chicken salad wrap one step further and dip it in your favorite salsa! 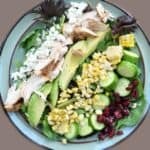 Get a recipe for the southwest chicken salad recipe below. Our Cranberry Chicken Salad Wrap is a classic recipe made with a healthy twist! It’s very similar to Waldorf Chicken Salad, but made with a delicious yogurt sauce, a little bit of honey, and lemon juice! 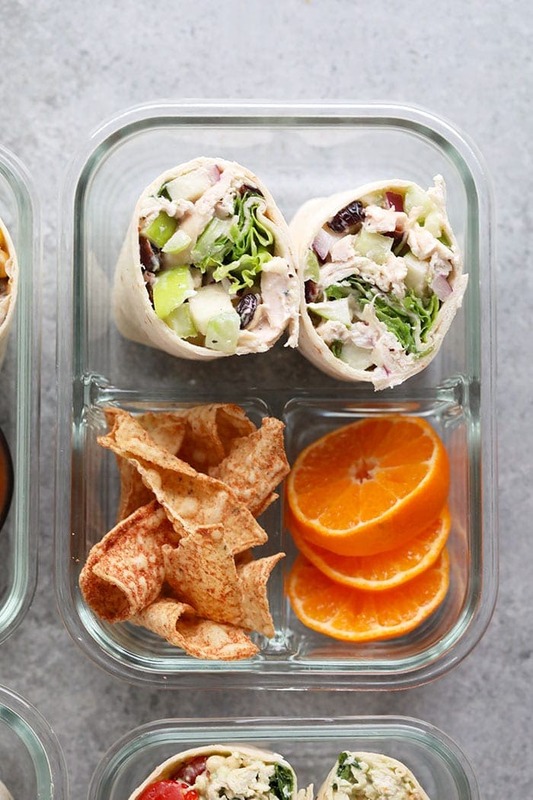 Pair your wrap with your favorite fruit and your favorite tortilla chip (our favorite chips are Siete chips). Get a recipe for the cranberry chicken salad recipe here. Please tell me you’re a BLT lover! This BLT Chicken Salad Wrap is so yummy and healthy too! The chicken salad sauce is so yummy and made with yogurt, a little bit of ranch seasoning (secret ingredient) and lemon juice! We love pairing it with our favorite kale salad and some tasty chips! Get the recipe for the BLT chicken salad recipe here. Place romaine lettuce on top of the tortilla. Then, add chicken salad and wrap tightly. Cut wrap in half and place inside of bento box. Next, add about 1/4 cup of your favorite salsa and a handful of chips into your bento box. Secure bento box tightly and pack for lunch!